When it comes to standards wars, Jasco isn’t taking any chances. 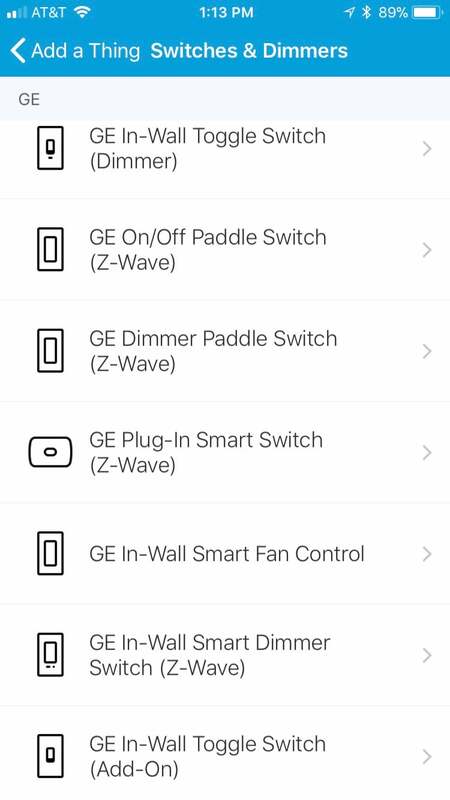 The manufacturer builds in-wall dimmers and plug-in lamp controllers based on both the Z-Wave and ZigBee platforms, marketing them with GE branding under a licensing agreement. Both classes can be controlled with voice commands via Alexa or Google Assistant, but the Z-Wave products require a third-party hub. The ZigBee products require a third-party hub, too, unless you’re connecting them to an Amazon Echo Plus (that smart speaker has a ZigBee controller built in). You’ll need to look elsewhere if you’re interested in Apple HomeKit compatibility. 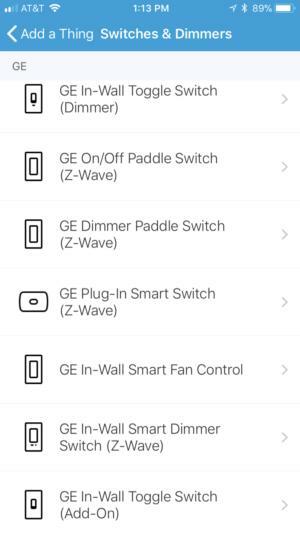 I tested the GE In-Wall ZigBee Smart Dimmer (model number 45857GE), the GE In-Wall Z-Wave Smart Dimmer (model 14294), and the GE ZigBee Plug-in Smart Dimmer (model 45852GE) with a Samsung SmartThings Hub that supports both protocols. Both GE smart dimmers resemble rocker switches, but their mechanisms don't really operate that way (the ZigBee model is shown here). 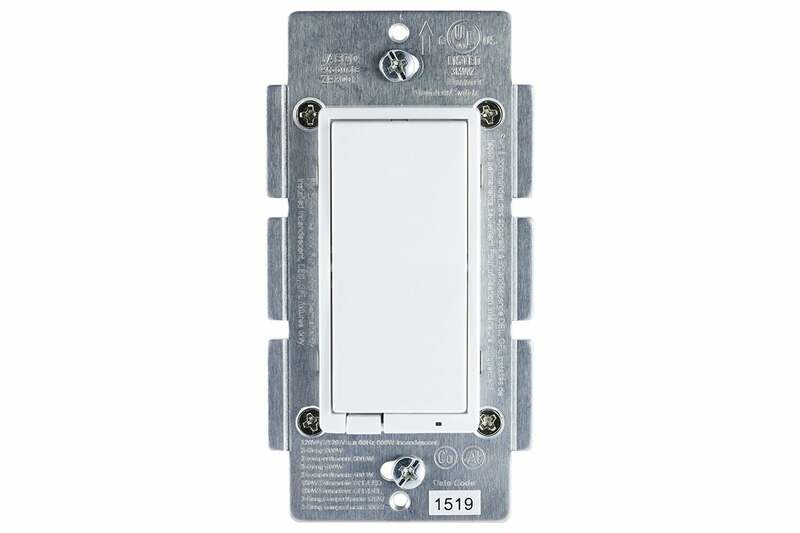 This dimmer replaces a standard light switch and can be wired through backstabs or screw terminals on the sides of the device. It requires the presence of a neutral wire, so make sure there’s one in your junction box before disassembling everything. 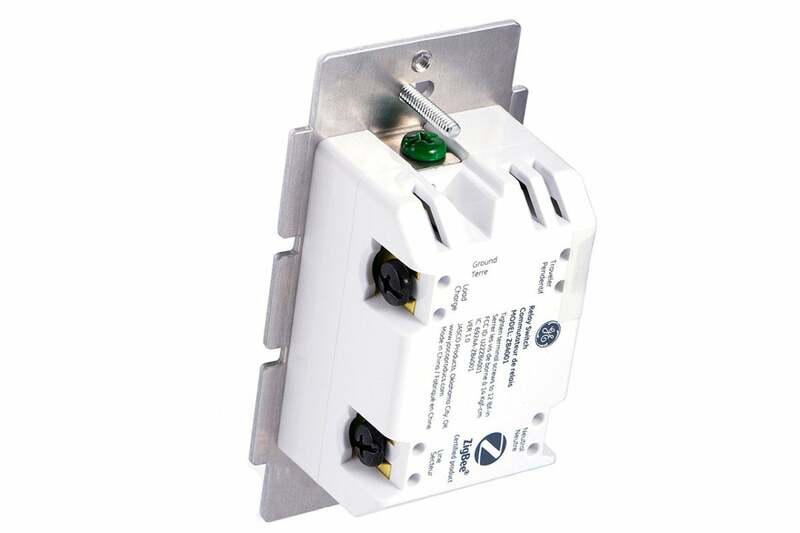 If you’re replacing a multi-pole switch, you’ll also need GE add-on switch at each of the other ends of the circuit (up to five). There’s nothing terribly unique about the wiring and installation process, though the recessed ground wire is a bit difficult to access. Unfortunately, the installation instructions included with the device are far from acceptable, and if you don’t have prior experience with these types of devices, they might do more harm than good. The installation guide includes an oversized diagram of a typical old-school switch (which you’re removing), but only a tiny diagram of the new switch (which you’re installing). The instructions aren’t just hard to read, they’re actively confusing. That said, with a little patience (or a lot of experience), everything should go together without too many surprises. Be advised, however, that the box includes both white- and almond-colored paddles, but it does not include a wall plate. You’ll need to either purchase a rocker-style plate separately or re-use the one you have if you’re replacing a switch of the same style. Actually, the switch only looks like a rocker. You’ll soon discover that it does not move much at all. Instead, you tap the top part of the switch to turn the light on, and tap the bottom to turn it off. Pressing and holding the top or bottom of the toggle will brighten or dim the light respectively (it’s compatible with dimmable LED, CFL, incandescent, and halogen bulbs). Both of the GE in-wall smart switches have screw terminals and backstabs as opposed to flyaway electrical leads (the ZigBee model is shown here). There are no indicators of overall brightness (such as the LEDs on Wemo’s superior W-Fi dimmer), and the dimming action can be slow. I also saw considerable flicker using an older LED bulb, but a newer one transitioned smoothly. A small LED on the bottom right-hand side of the dimmer will help you locate it in the dark. You can’t turn the LED off (unless you turn the switch on), but it’s small enough that you could cover it with a bit of white tape if it bothers you. I experienced quite a bit of trouble pairing the device to my SmartThings hub. Despite instructions to the contrary and multiple attempts to cut and restore power, the dimmer would simply not enter pairing mode. After a call to tech support, I was alerted to the device reset process (which is documented, but is unclear as to its utility) as a mean of rebooting the pairing process. Three resets later, I finally got the switch to join my SmartThings network. 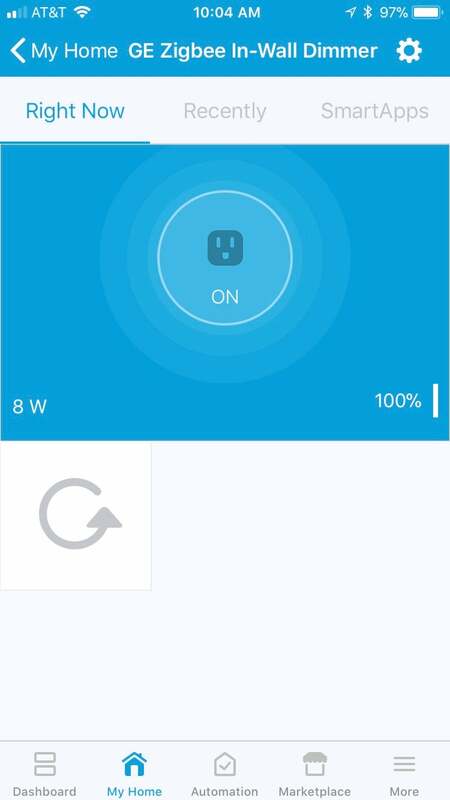 Once paired, I found the GE dimmer to behave like any other SmartThings device, and basic automation tools worked just fine. One bonus feature within the SmartThings app: real-time energy monitoring is built into the interface. Overall, while the dimmer is both reasonably capable and attractive, I had enough headaches during installation to hesitate to recommend it. Better options abound at similar prices. 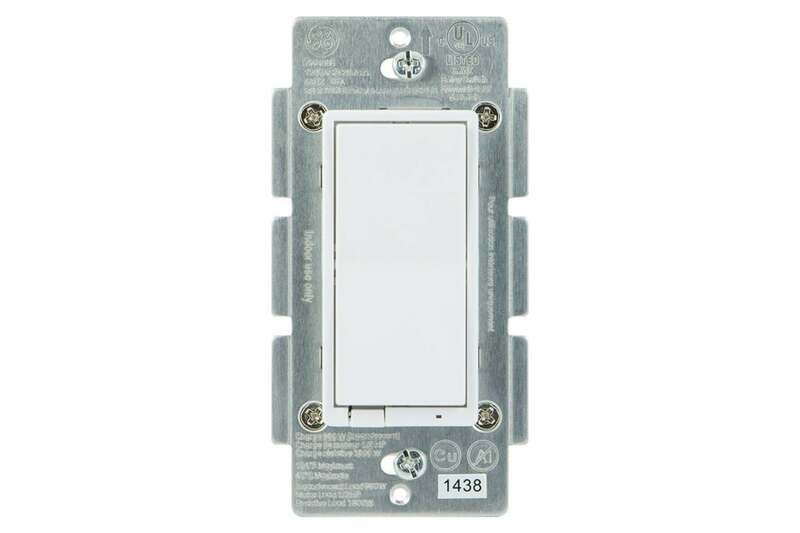 A small LED at the bottom right-hand corner of both GE smart switches glows when the dimmer is turned off, to help you locate it in a dark room (the Z-Wave Plus model is shown here). 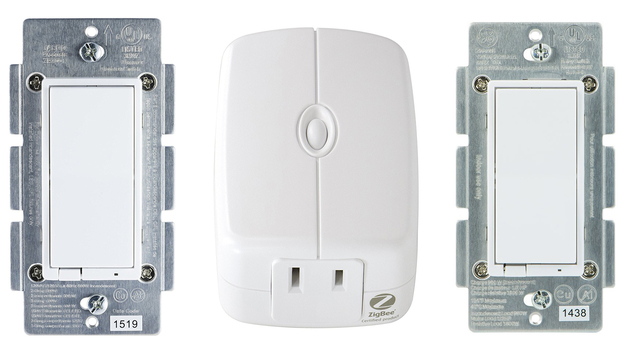 The Z-Wave Plus version of Jasco’s GE Smart Dimmer is virtually identical to the ZigBee version, including requiring the presence of a neutral wire and GE add-on switches for multi-pole installations (up to five). The hardware installation process was also very nearly the same. That said, the manual included with this product is slightly different, but even more scattered and confusing. We tested Jasco's GE smart lighting products by enrolling them to a Samsung Smart Things hub. Once installed and paired with your Z-Wave hub of choice (here again, the instructions are frustratingly confusing), the switch operates in the same fashion as the ZigBee model (read my review above for details). I paired the device to my SmartThings hub without any trouble. 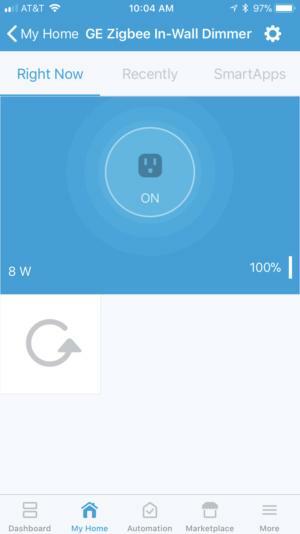 (The trick is that this version of the dimmer doesn’t need to any special pairing mode to connect, so SmartThings found it right away.) The only significant difference in operation is that this dimmer does not include an energy-monitoring feature; otherwise, everything worked well in my tests. For whatever reason, Jasco’s list price for the Z-Wave dimmer is $10 less than the list price for its ZigBee model ($44.99 vs $54.99). If you don’t already own a smart home hub, but you do have an Echo Plus, you might want to give the ZigBee model a go despite my reservations. If you do have a Z-Wave-compatible hub, GE’s Z-Wave dimmer is the better choice of the two. You can manually control a connect lamp pressing the recessed button on the ZigBee plug-in dimmer. For impermanent light sources (i.e. lamps with dimmable bulbs), GE offers plug-in dimmers with either Z-Wave or ZigBee capabilities, though the company sent only the former for this review. Both require grounded, three-prong receptacles, and both are equipped with an always-on three-prong pass-through. The controlled outlet will accept only two-pronged plugs. The Jasco smart plug-in dimmer is ginormous compared to Lutron’s Caseta plug-in dimmer—measuring 4 inches wide by 2.5 inches high by 1.5 inches deep—but it won’t block the second outlet when plugged into a two-gang in-wall receptacle. In SmartThings, controls are bare-bones, but note the energy monitor included with both ZigBee units. A semi-recessed button on the front of the unit powers the ZigBee outlet: A single press turns the attached lamp on or off. Hold the button down and it will dim or brighten the attached lamp, though in my testing, this function was very slow to operate, and button is hard to get a grasp on. Unlike the ZigBee In-Wall switch, the Plug-in dimmer showed up immediately in the SmartThings app, and I was able to add it to my network with no trouble at all. Within SmartThings, it offers the full range of lighting controls, including automation features and manual on/off/dimming functionality. Compared to the in-wall dimmer, its dimming range is limited, but the dimming action is smoother. Within SmartThings, it also reports real-time energy consumption. 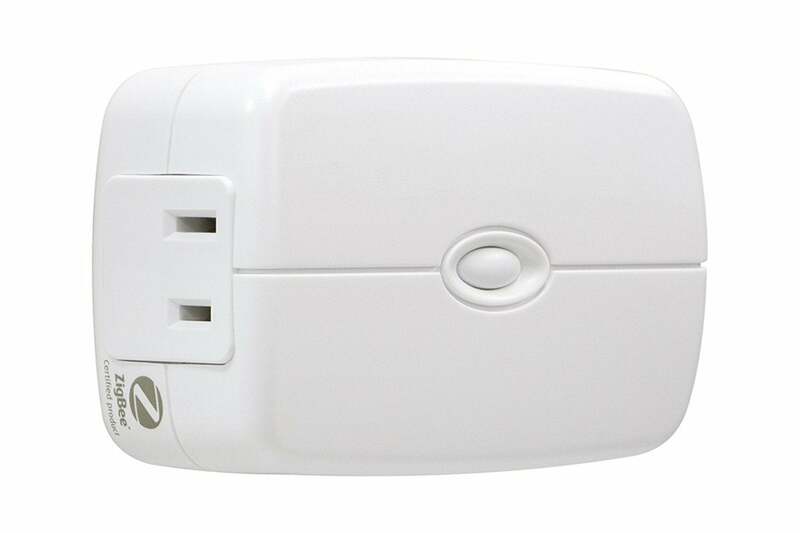 The ZigBee Plug-in Smart Dimmer can handle up to a 300-watt incandescent load or a dimmable CFL or LED bulb up to 100 watts. The maximum load on both outlets is 15 amps or 1,800 watts. If you don’t mind its overstuffed size, it’s not a bad choice for a dimmable smart plug. It’s a safe guess that its similarly-spec’d Z-Wave cousin is equally capable.